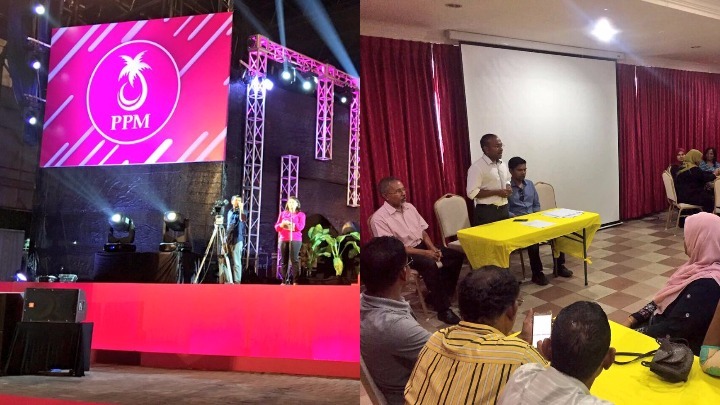 Both the PPM and MDP have been gearing up for the campaign in recent days. 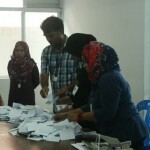 The stakes in the Maldives’ third local council election are higher than the previous polls as it will put claims of overwhelming public support to the test. Campaigning by both the ruling and opposition parties for the April 15 local council elections is underway across the country following multiple delays to the polls. 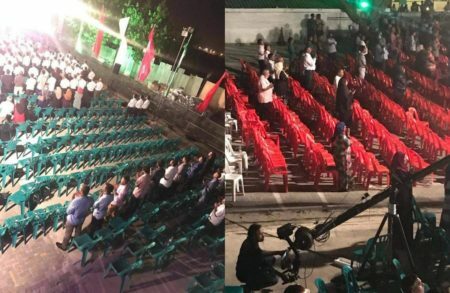 On Thursday night, the ruling Progressive Party of Maldives held a rally in Malé dubbed ‘Heyvalla’ (Raring to go) to hand over tickets to the party’s candidates, launching a campaign platform that stresses the importance of cooperation at the local government level to ensure economic development. The main opposition Maldivian Democratic Party, which conducted internal primaries in November, has meanwhile been holding street corner campaign rallies on several islands. Following the uncontested election of Hassan Latheef as the party’s new chairperson, the MDP also conducted a campaign workshop for district teams in Malé last week to prepare for door-to-door visits in the capital. The stakes in the Maldives’ third local council election are higher for both sides than the previous polls as it will put claims of overwhelming public support to the test. Ahead of next year’s presidential election, the outcome will be a crucial gauge of backing for President Abdulla Yameen’s three-year administration, which has been beset by multiple political crises, a corruption scandal of historic proportions, and a bitter leadership dispute that split the ruling party. In his speech at Thursday’s rally, Yameen declared that “there is no safety in any colour other than [the PPM’s] magenta”, which he said is “the cure to all ills”. Rehashing rhetoric used against the MDP in previous campaigns, Yameen said that the government’s aim is to foster a generation that values Islam and nationhood in order to ensure that an ideology of introducing other religions does not get “within 10 miles” of the country. Efforts to that end include establishing the Islamic university and a programme that commenced recently to train 5,000 Arabic language teachers, he said. Yameen went on to highlight the government’s achievements in the health and education sectors and reiterated the claim that 64,000 new jobs have been created since he assumed office in November 2013. 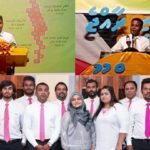 Other speakers also underscored the government’s successes and urged the public to vote for PPM candidates, who they said will work with the administration to deliver development projects. Ahead of the rally, the PPM drew ridicule on social media after a net was set up as a fence around the rally grounds. During a rally in November – where state employees were forced to attend due to alleged bribery, coercion and threats of salary reductions and dismissals – local media published photos showing rows of empty seats. As in Thursday’s rally, attendees were required to walk through a metal detector to enter the carnival grounds. In November, employees of state-owned enterprises were given a sticker with a serial number upon entry. Several reportedly left after their attendance was marked. Photos of the net fence meanwhile went viral on Thursday. PPM has a brilliant idea to keep people until the end of their rally. “Has compulsion still not been proven?” asked the daughter of former president and deposed PPM leader, Maumoon Abdul Gayoom. However, towards the end of the rally, several rows at the back were vacant. 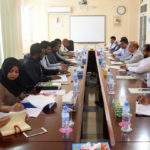 Meanwhile, as both parties gear up for April’s election, the leadership has been meeting with focal points in Malé and the atolls in recent days. 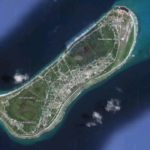 Teams made up of ministers and ruling party lawmakers have also been touring islands in several atolls. After visiting islands in Alif Dhaal atoll last month, Environment Minister Thoriq Ibrahim and PPM MP Saud Hussain left for the islands of Kolamaafushi and Gadhdhoo in Gaaf Alif atoll this morning. A team of senior MDP officials is presently visiting islands in Alif Dhaal and Alif Alif atolls to canvass support. 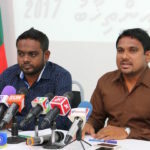 The Adhaalath Party, which was planning to contest 50 seats in a coalition with the MDP, decided to boycott the polls in protest against the delay. Earlier this month, the elections commission – which the opposition contends is stacked with Yameen’s loyalists – postponed the polls again to April 15, claiming that public schools were unavailable to set up polling stations at an earlier date. Last week, the commission extended a deadline to submit candidacy papers to February 28 after the PPM-dominated parliament amended the electoral law to allow individuals with criminal records to contest. The MDP condemned the last-minute change in the eligibility criteria as “contrary to every principle of democracy and justice”. The commission meanwhile announced on Sunday that the deadline for voter registration is March 2. Voters who wish to vote either outside their native island or overseas will have to re-register by submitting a form to island councils or the commission’s election headquarters at the old Jamalludeen school building in Malé. The commission said today that mobile stations for re-registration have also been set up at the ferry terminals in the capital’s suburbs Hulhumalé and Vilimalé. Maldivians living in India and Sri Lanka can re-register to vote in the neighbouring countries by submitting forms at the consulate office in Trivandrum and the Maldives embassy in Colombo. Ballot numbers will be assigned to candidates by a lottery draw on March 6. According to the elections commission, 563 councillors will be elected to 179 island councils, 67 councillors to 18 atoll councils, and 23 councillors to three city councils.